... your basement fills up with 6" of water. That's how the saying goes, isn't it? At least our basement is unfinished, so most stuff survived. Our dryer is on the fritz, we'll need to replace the water heater soon, and we spent $700 getting the water pumped out... but I guess that's just the fun of owning a home! When I discovered the flooded basement, I was a bit amused that our dehumidifier was just humming away right in the middle of it. Like, "I'm trying guys, but this is a lot to deal with!" The water heater shut off during the flood, so I had to heat Mae's bath water on the stove. Normally, we could have just skipped bath day, but not when she looks like this! Making birthday cards is messy work! We spent the weekend at my parents' house celebrating my dad's 60th birthday. 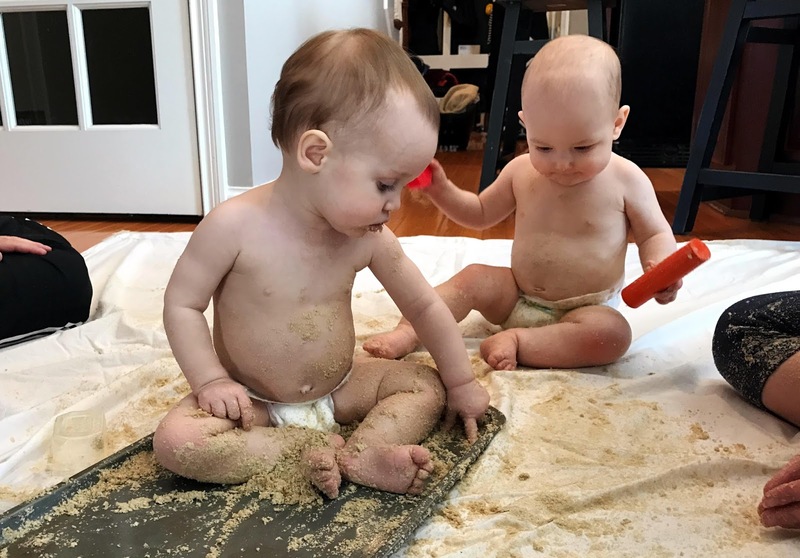 On Saturday, Emily brought over some homemade edible "cloud dough" for play time with Oliver and Mae. Oliver dove right in to the oatmeal and coconut oil mixture, but Mae decided to sit back and watch for a bit. While Oliver attempted to coat every surface of his body in it, Mae shoveled handfuls into her mouth. Then she crawled into the pan and had fun smashing her hands and feet into the sandy texture. They finished up with a bath in the giant kitchen sink! 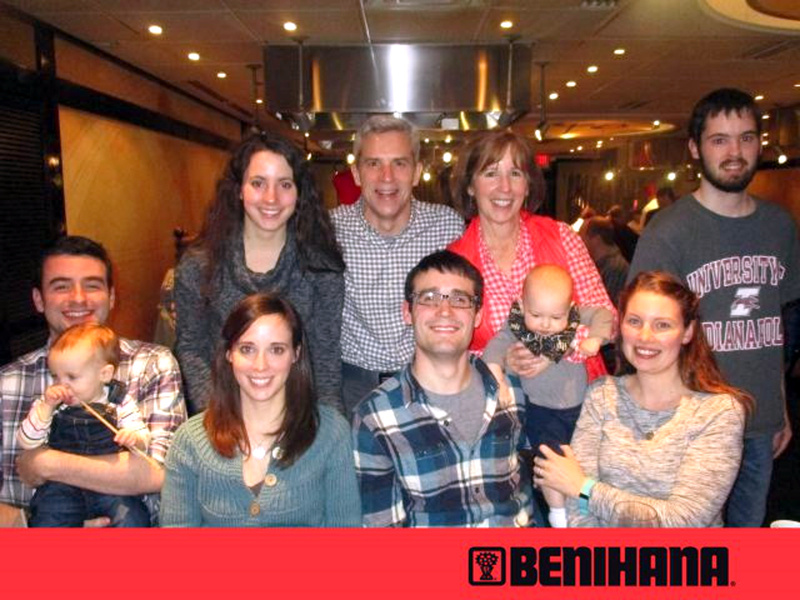 Later that day, we went bowling (Mae and Oliver played in the Pack 'n Play) and then to dinner at Benihana. Mae was enthralled with all the noise and action of the restaurant. This was the third birthday celebration for Dad since he also celebrated last weekend with extended family and during the week on his actual birthday. He will continue to celebrate throughout the summer as he enjoys his birthday gifts: comedy show tickets, symphony tickets, baseball game tickets, museum tickets, concert tickets, and a boat ride. Lots of excuses to spend time with family! Lastly, the most exciting news I've had in a while: Mae is WEANED! I finally added dairy back to my diet and have since enjoyed macaroni and cheese, Taco Bell, ice cream, candy bars, cheese and crackers, cottage cheese, mashed potatoes, yogurt, and biscuits! I'm still in desperate need of a pizza. Woo hoo! Oh nooo! Not the basement... I hope it's all dried up (you're right, the dehumidifier is pathetically cute).